Description: Constructed by durable Brown Faux Fur Pile and Black Edge Aaron Cloth , this Kids sofa is extraordinarily stable and comfortable for a long period of time to accompany them.Not only is it comfortable, but durable, and easy to clean. PREMIUM QUALITY - Constructed by durable Brown Faux Fur Pile and Black Edge Aaron Cloth , this Kids sofa is extraordinarily stable and comfortable for a long period of time to accompany them. 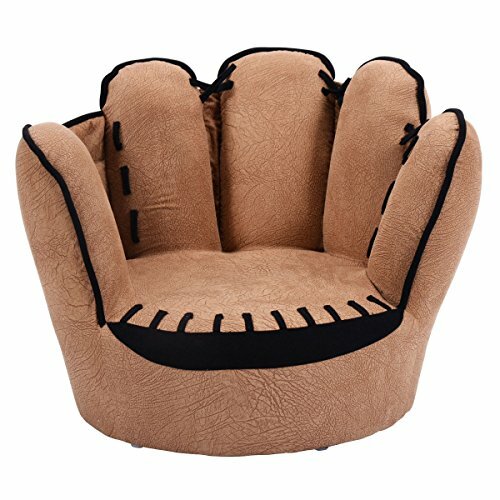 UNIQUE DESIGN - Finger Style Armchair is attractive and appealing spot to let your kids spend more leisure time on their own furniture to sit, read stories, watch movies, eat snacks, play or just relax. Sofa Dimension: 23"x19"x17" (LxWxH). Seating Area Size: 15"x14" (WxD), Weight: 13 lbs, Weight Capacity: 110 lbs, Suitable at ages from 1-5 years old.